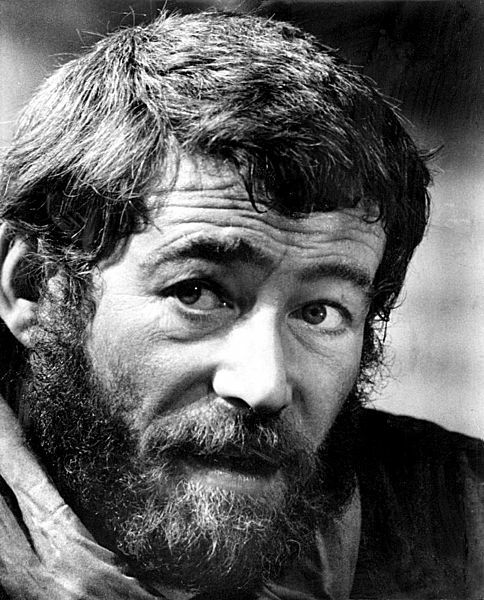 Peter O’Toole was the British (or possibly Irish) star of stage and screen. He was the finest actor never to win a competitive Oscar in the history of cinema; nominated a record eight times. He won four Golden Globes, a BAFTA, and an Emmy, and was the recipient of an Honorary Academy Award in 2003. The actor played Hamlet under Laurence Olivier’s direction in the premiere production of the Royal National Theatre in 1963. His London stage roles were many, mostly at the Old Vic and with the Royal Shakespeare Company… King Lear, Othello, Pygmalion, A Midsummer Night’s Dream, The Taming of the Shrew, The Merchant of Venice, and Caligula. Severe illness almost ended his life in the late 1970s. His stomach cancer was misdiagnosed as resulting from his alcoholic excess. O’Toole underwent surgery in 1976 to have his pancreas and a large portion of his stomach removed, which resulted in insulin-dependent diabetes. In 1978, he nearly died from a blood disorder. Peter O’Toole was offered a knighthood in 1987, but turned it down for personal and political reasons. He was a noted fan of Rugby Union, and attended Five Nations matches with friends and fellow rugby fans Richard Harris, Peter Finch, and Richard Burton. Other pals in his circle: Omar Sharif and Albert Finney. On July 10th, 2012, he retired from acting. The always controversial… the amazingly talented… Peter O’Toole was 81. This entry was posted on Sunday, December 15th, 2013 at 11:22 am	and is filed under Blog by Manny Pacheco. You can follow any comments to this post through the RSS 2.0 feed. Responses are currently closed, but you can trackback from your own site.